A Kilner jar filled with White Chocolate Mice, Lemon Bonbons and most importantly Treacle Toffee – the perfect treat for Halloween and Bonfire Night! Definitely three of my favourite types of retro sweets and they were all mine… until my daughter came home anyway. Though by that point I had possibly eaten a third of the jar… well I was working and hadn’t had any lunch. The fact I was buzzing around due to the sugar rush was of no consequence or concern! If you want to make Halloween a little more special this year then definitely check out the amazing sweets on offer over at The Gobstopper – with White Chocolate Mice, Fangs, Liquorice Wands and specially made Trick or Treater’s Jars, there really is something for everyone! Personally I could eat everything and I always find myself drooling and reminiscing when I visit the site. To walk into the shop would be utterly dangerous for me…! With Bonfire Night literally round the corner too, there are some awesome treats to choose from including Treacle Toffee, surely the absolute, best every bonfire night treat? Atomic FireBlast would also ensure your tongue was on fire – does anyone recall the cinnamon balls?! Ouch, but super yummy! 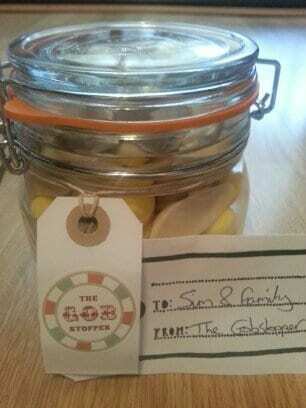 So, whilst I am sat here, happily adding to my earlier sugar rush by eating more Lemon Bonbons – I am happy to announce that The Gobstopper have kindly given Sim’s Life an utterly delicious Chocoholics Box to give away… I am insanely jealous! I’d fill it with lemon crystals and pop a lolly on the top! Oh WoW so much choice on the website the gobstopper! I would have some Shrimps, Milk Bottles & Foam Mushroom’s YUMMY! White chocolate mice for certain! Has to be Black Jacks! White Chocolate Mice, would be good to have some mice in the house that haven’t been brought in by the cats …. Ohhh some butterscotch and sweet tabacco. Sugar free aniseed twists – I didn’t know such things existed! I would choose Alphabet Letters as my son is Alphabet mad and we could play as we munched! Pontefract Cakes without a doubt, that is until they start stocking Scottish ‘sweeties’! Bring on the yummy! Would have to be the black and white mints! ooh Blackjacks definitely, I used to love them when I was a kid! Treacle Toffee – Mum had a shop when I was little and we had trays of toffee on the counter. When a customer asked for 2 ounces or a quarter if they were in the money you hammed a few pieces off and scooped them into a paper bag. Lovely happy memories! I’m not sure I could pick just one thing! I love all sorts of sweets, so it would depend how I felt on the day! Yum! Ginger Creams love them as much as my nana did…. Gotta be Chocolate Covered Ginger. Dark Chocolate with a fire inside-mmmmm! Black Jacks – love they way they turn your tongue black! Rhubarb and custard, refresher chews, Fruit salad, bananas, sherbet fruits….mmmmm so close to ordering right now!! I have a real sweet tooth and love them all from Mojo’s, pear drops, cola cubes and rainbow drops to anything made from chocolate. It would have to be kola Kubes and fruit salad! Yum! Black Jacks, love them to this day. Aniseed balls. A favourite since childhood. blasck jacks and fruit salad or treacle toffee! chocolate turkish delights mmm heaven!! Those treacle toffee’s sound like heaven! Chocolate Cinder Toffee – i used to have to walk past a factory that made it on the way to school – they had a factory shop too so never actually went straight past! Got to be the Scottish Tablet, yum! Lemon bonbons – I love them and they’d last for ages. It has to be foam mushrooms. I had forgotten about them! If I could only have one it would be Coconut Ice but their click and mix would be my choice so I could add cola bottles, anglo bubbly, black jacks. apple bonbons, choc nibbles. fangs, fired eggs, fizzy snakes and friendship rings and thats only from their first page. White chocolate mice – every single time!